The latest in a long series of bloody terrorist attacks attributed to the Islamic State of Iraq and Syria (ISIS) unfolded in Iran early Wednesday with coordinated armed assaults on the Iranian Parliament (Majlis) and the mausoleum of the late supreme leader of the Islamic Republic, Imam Khomeini. 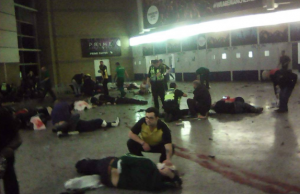 At least 12 people were killed and 43 wounded. The reactions of the US government and the Western media to the attacks in Tehran stand in stark contrast to their response to the May 22 bombing that killed 22 people at the Manchester Arena and the London Bridge attacks that claimed nine lives last Saturday. “We underscore that states that sponsor terrorism risk falling victim to the evil they promote,” an attitude that found its reflection in the relative indifference of the media to the loss of Iranian lives. It is clearly understood that terrorism against Iran serves definite political aims that are in sync with those of US imperialism and its regional allies. Members of Iranian forces take position during an attack on the Iranian parliament in central Tehran, Iran, June 7, 2017. Omid Vahabzadeh/TIMA. For its part, Tehran’s reaction to the attacks was unambiguous. It laid the responsibility at the door of the US and its principal regional ally, Saudi Arabia. “This terrorist attack happened only a week after the meeting between the US president (Donald Trump) and the (Saudi) backward leaders who support terrorists,” Iran’s Revolutionary Guard Corps (IRGC) said in a statement, published by Iranian media. 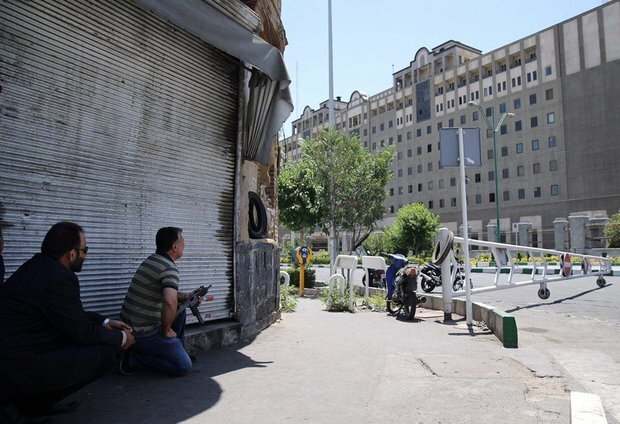 The attack was understood in Tehran as a political act carried out in conjunction with identifiable state actors and aimed at furthering definite geostrategic objectives. The same can be said of the earlier acts of terrorism carried out in Manchester and London, as well as those in Paris, Brussels and elsewhere before them. The Western media routinely treats each of these atrocities as isolated manifestations of “evil” or religious hatred, irrational acts carried out by madmen. In reality, they are part of an internationally coordinated campaign in pursuit of definite political objectives. Underlying the violence on the streets of Europe is the far greater violence inflicted upon the Middle East by US, British and French imperialism, working in conjunction with right-wing bourgeois regimes and the Islamist forces they promote, finance and arm. 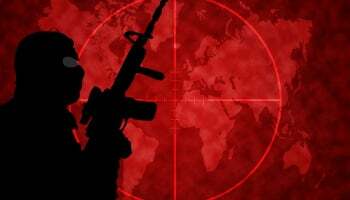 ISIS is itself the direct product of a series of imperialist wars, emerging as a split-off from Al Qaeda, which got its start in the CIA-orchestrated war by Islamist fundamentalists against the Soviet-backed government in Afghanistan. It was forged in the US war of aggression against Iraq that killed close to a million Iraqis, and then utilized in the 2011 war to topple Libya’s leader Muammar Gaddafi. Fighters and arms were then funneled with the aid of the CIA into the war for regime change in Syria. The latest round of terror has its source in growing dissatisfaction among Washington’s Middle Eastern allies and its Islamist proxy forces over the slow pace of the US intervention in Syria and Washington’s failure to bring the six-year war for regime change to a victorious conclusion. The people giving the orders for these attacks live in upper-class neighborhoods in London, Paris and elsewhere, enjoying close connections with intelligence agencies and government officials. Far from being unknown, they will be found among the top ministers and government officials in Damascus if the US-backed war in Syria achieves its objectives. Those who carry out the terrorist atrocities are expendable assets, foot soldiers who are easily replaced from among the broad layers enraged by the slaughter carried out by imperialism in the Middle East. The mass media always presents the failure to prevent these attacks as a matter of the security forces failing to “connect the dots,” a phrase that should by now be permanently banned. In virtually every case, those involved are well known to the authorities. In the latest attacks in the UK, the connections are astonishing, even given the similar facts that have emerged in previous terrorist actions. One of the attackers in the London Bridge killings, Yousseff Zaghba, was stopped at an Italian airport while attempting to travel to Syria, freely admitting that he “wanted to be a terrorist” and carrying ISIS literature. Another was featured in a British television documentary that chronicled his confrontation with and detention by police after he unfurled an ISIS flag in Regent’s Park. The Manchester suicide bomber, Salman Abedi, was likewise well known to British authorities. His parents were members of the Libyan Islamic Fighting Group (LIFG), who were allowed to return to Libya in 2011 to participate in the US-NATO regime-change operation against Muammar Gaddafi. He himself met with Libyan Islamic State operatives in Libya, veterans of the Syrian civil war, and maintained close connections with them while in Manchester. What has become clear after 16 years of the so-called “war on terrorism”—going all the way back to the hijackers of 9/11—is that these elements move in and out of the Middle East, Europe and the US itself not only without hindrance, but under what amounts to state protection. Why have they enjoyed this carte blanche? Because they are auxiliaries of US and European intelligence, necessary proxies in wars for regime change from Libya to Syria and beyond that are being waged to further imperialist interests. If from time to time these elements turn against their sponsors, with innocent civilians paying with their lives, that is part of the price of doing business. In the aftermath of terrorist actions, governments respond with stepped-up measures of repression and surveillance. Troops are deployed in the streets, democratic rights are suspended, and, as in France, a state of emergency is made the overriding law of the land. All of these measures are useless in terms of preventing future attacks, but serve very well to control the domestic population and suppress social unrest. If the mass media refuses to state what has become obvious after more than a decade and a half of these incidents, it is a measure of how fully the linkage between terrorism, the Western intelligence agencies and the unending wars in the Middle East has become institutionalized. Innocent men, women and children, whether in London, Manchester, Paris, Tehran, Baghdad or Kabul, are paying the terrible price for these imperialist operations, which leave a trail of blood and destruction everywhere. Putting a stop to terrorist attacks begins with a fight to put an end to the so-called “war on terrorism,” the fraudulent pretext for predatory wars in which Al Qaeda and its offshoots are employed as proxy ground forces, operating in intimate collaboration with imperialist intelligence services and military commands.